Sorry for the delay in posting, everyone. We are still without power, Internet and phones. Hurricane Irene, a/k/a Tropical Storm Irene if your insurance company only covers hurricanes, hit us in the early morning hours on Sunday, August 28. It started off with rain followed by wind gusts. But in the end it was very destructive. We awoke Saturday morning to a vivid pink sky, the ancient mariner's warning of weather to come. We spent Saturday filling water buckets, getting provisions - lights and batteries (though we forgot the ever elusive C batteries for the radio), candles, easy prep food, etc. at the ready . I cleared off the porches, secured anything that might turn into a missile in the wind (the beloved canoe, for example), and put the giant house plants summering outdoors into the garage. Storm windows were closed and emergency kits prepared -chainsaw, rain gear, dog food, mementos, change of clothes. We went to bed Saturday night and waited. It was a fitful night. I awoke every few hours to check the status of the storm. Aside from the heavy rain, so far so good. We woke Sunday to wind and rain, but nothing more than we were used to over the summer (we had a severe micro-burst a month ago that took down trees without mercy). By mid-morning, it seemed as if we were going to be okay. Then the first tree went down. We immediately knew the sound as the large maple between our house and the neighbor shed one third of its trunk and limbs. It landed in the neighbors yard, damaging his deck, but nothing serious. It changed our moods though. We set up camp in the front living room and debated whether it was prudent to go to the cellar yet. Thirty minutes later the second third of the tree went into the neighbor's house. The wind was unleashed now, and the remaining third of the maple was aimed at our house. As we headed to the basement the lights went out. Not the flicker-flicker-darkness we were accustomed to, but instant horror-movie-cut-the-power outage. Within a minute we smelled smoke. Heather called 911 and I rushed around to be sure it was not our house on fire. 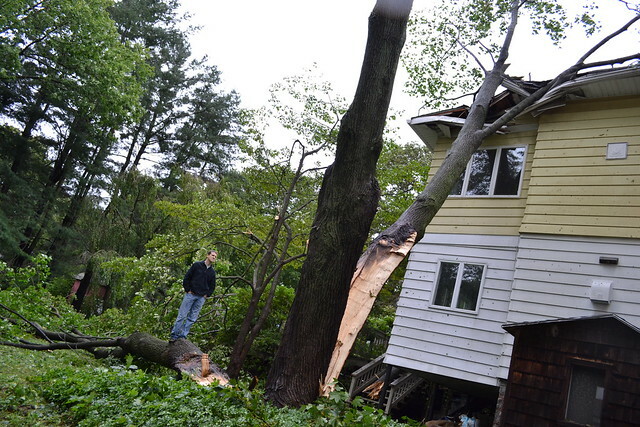 A large oak was toppled two houses down the hill, shearing the power lines from the pole. The live wires sparked and started a fire in the drenched front yard of our neighbor. Fortunately, a vigilant neighborhood means everyone had called 911 at the same time and the Fire Department was immediately on scene. While the trucks arrived, a second mature oak tree a block up the street went down, barley missing the fire truck atop the hill, but draping the power lines over it. The truck escaped unscathed, as did the police officer who was standing nearby. The scene replayed itself throughout our town for the rest of the afternoon. Irene took down old sentinels and broke telephone poles in half as she made her way north. By 5 PM, all that remained was light intermittent rain. We ventured out carefully, minding the police tape and giving wide berth to downed lines. NEVER GO NEAR DOWNED POWER LINES! This seems obvious but we watched people stand within arms-length without concern. Downed lines still have plenty of energy. Many people think that once they are down, a circuit breaker trips and they are safe. We learned otherwise from the utility workers that arrived early evening to disconnect power to the line that started the fire. It was a hurricane as far as we could tell. We spent the night in the downstairs in the living room as the wind continued to howl through the evening. The remaining portion of the maple leaning precariously towards our house stood its ground, but we were not taking chances. By Monday morning the sun was shining and the clean-up began. It is now Thursday, and we do not expect to be restored for at least three more days. The utility companies are working as fast as possible, but they have a whole state to repair. 1. While we don't have electricity, we do have city water that never stops flowing. 2. A cold shower is not ideal, but we sure use a lot less water and energy, and it wakes you up faster than a cup of joe. 3. We have a natural gas stove and are able to heat water and cook without concern. 4. We lost the perishables pretty quickly, but are not starving as ice and groceries are still available. Though ice is pretty scarce. 5. We are safe with no damage to our friends, neighbors and property. Events like this are few and far between for us. But you realize what you can really endure if you have to. A little hardship is a good reality check for people. We will have electricity again, and Internet and normalcy, sooner than later. Thank you for your patience. We should be back on schedule for next week. Thoughts to everyone still affected by the storm, especially Vermont, where the damage was catastrophic.